KUWAIT: These photos provided by Kuwait Municipality show houses where construction violations were detected during crackdowns. 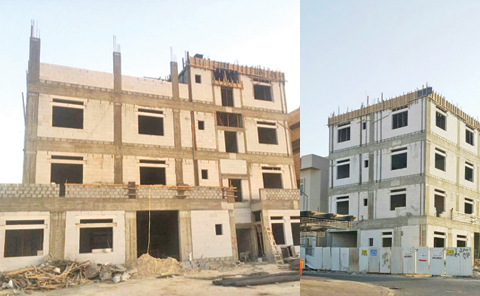 KUWAIT: Capital and Mubarak Al-Kabeer municipality branches found 100 houses in violation of the construction law. Assistant Director General for Capital and Mubarak Al-Kabeer Affairs Faisal Al-Jumaah said the owner of a house under construction had built more than three floors, and a warning was issued to remove the violations. He said the house’s owner obliged. Kuwait Municipality’s public relations department announced the start of its inspection campaigns at Ahmadi branch, which was launched under the slogan ‘your health is our concern,’ as part of preparations for the holy month of Ramadan. The raids included Fahaheel, and resulted in closing a butcher shop and a food store. Branch Director Fahad Al-Tshili said emergency teams will carry out daily campaigns according to the plan. Meanwhile, the Ahmadi emergency team inspected food and meat stores in addition to spice shops, that resulted in closing two stores and issuing seven citations. The Interior Ministry’s General Traffic Department carried out a campaign in all governorates from May 22 to May 28. The campaign resulted in issuing 42,583 violations, 1,710 cars and 13 motorcycles were impounded, 47 persons were jailed and five expats were sent for deportation for driving without licenses. The traffic department, in cooperation with the Public Works Ministry, also said the right lane of Al-Ghous street in Mishref will be closed near the water pump heading towards Sixth Ring Road for one month for maintenance. Traffic detectives arrested a driver who had a decal of former Iraqi president Saddam Hussein on his car, images of which went viral on social media. The car was found in Um Al-Haiman, and was registered in the name of a citizen. But the driver was a Saudi, who had already removed the sticker. Traffic officers issued a citation and he was sent to the state security department for legal action.